We use professional AutoMagic products, which results in high level of the service provided. Globally, AutoMagic products are the first choice of enterprises offering professional care for vehicles. We use best quality sponges and renew the stock regularly. This practice results in reducing the possibility of damaging the car finish to the minimum. 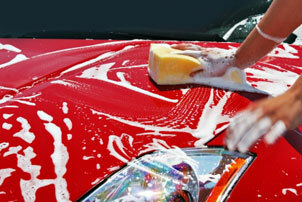 Using the hand-applying tool, wax is applied which prolongs car finish durability. To clean the inside of vehicles we use industrial multi-engine vacuum cleaners and interior-friendly products which have no effect on driver’s or passengers’ wellbeing. Our choice of cleaning cloth follows the same criteria; it is not available in shops, as it is dedicated solely to the cleaning of the interior, is not abrasive and does not damage wood, aluminium or glass (navigation displays). Car finish can receive further damage at polishing by using an ordinary angle grinder with polish accessories; it is practically impossible to ensure neither an even layer of a polish or the angle of treatment. We use a professional dual-head Cyclo-Risk Free polisher; in combination with our expert use it guarantees your car’s beauty and shine. Modern technology enables us to achieve dry-cleaning results. As with our other services, no hazardous products are used. We clean your vehicle from top to bottom; the procedure lasts approximately 8 hours and generally you can pick your car up the next day.